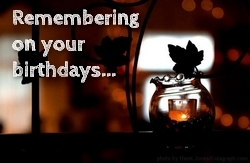 Here at the MISS Foundation, we remember all the birthdays this month of all the children we love who have died. If your child’s name is not listed and their birthday is this month,please click here to fill out a new self-intake form to send your most current information to us for our database. Thank you!